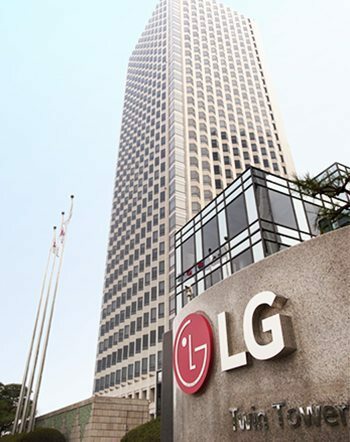 LG Display reported today unaudited earnings results based on consolidated K-IFRS (International Financial Reporting Standards) for the three-month period ending March 31, 2016. Revenue in the first quarter of 2016 decreased by 20% to KRW 5,989 billion from KRW 7,496 billion in the fourth quarter of 2015 and decreased by 15% from KRW 7,022 billion in the first quarter of 2015. Operating profit in the first quarter of 2016 recorded KRW 40 billion, a quarter-on-quarter decrease of 34% from the operating profit of KRW 61 billion in the fourth quarter of 2015, and a year-on-year decrease of 95% from the operating profit of KRW 744 billion in the first quarter of 2015. EBITDA in the first quarter of 2016 was KRW 853 billion, compared with EBITDA of KRW 882 billion in the fourth quarter of 2015 and with EBITDA of KRW 1,595 billion in the first quarter of 2015. Net income in the first quarter of 2016 amounted to KRW 1 billion, compared with the net loss of KRW 14 billion in the fourth quarter of 2015, and a year-on-year decrease from the net income of KRW 476 billion in the first quarter of 2015. LG Display announced its sixteenth straight quarterly operating profit at KRW 40 billion, which resulted from a thorough and profit-focused management based on differentiated technologies in response to a difficult market situation caused by panel oversupply and falling panel prices. 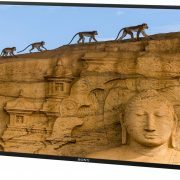 To deal with the difficult market situation, LG Display reduced the manufacturing of TV panels of 30-inches and below, which faced a large fall in prices, while expanding production of 40-inch range TV panels and those of 60-inch and above. 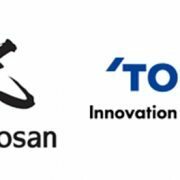 The company also increased profitability by focusing on premium differentiated products based on M+ technology and maximized production efficiency in its overall operations by flexibly allocating production between IT product panels and TV panels. Panels for TVs accounted for 38% of the revenue in the first quarter of 2016, tablets and notebook PCs for 24%, mobile devices for 23%, and desktop monitors for 15%. With 77% in the liability-to-equity ratio, 153% in the current ratio, and 15% in the net debt-to-equity ratio as of March 31, 2016, the financial structure of the company remains stable. 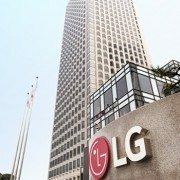 LG Display will continue to increase profitability by concentrating on premium products such as Ultra HD TV panels based on its M+ technology to respond to a growing demand for large-size TVs, and make efforts to maximize efficiency by improving the manufacturing process in the second quarter of 2016. During the morning conference call on 27 April, LGD emphasized that the proportion of panel for ultra large size TV is increasing. 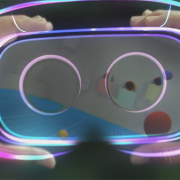 LGD reported that OLED panel shipment in Q1 2016 is slightly less than 200,000 units and estimated they will be able to ship 1 million units this year. While the 55 inch occupied over 85% of the total in 2015, in this year’s quarter the 55 inch proportion decreased slightly and 65 inch increased up to 30%. 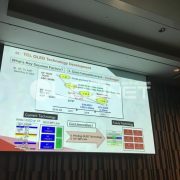 LGD is operating OLED panel mass production line at 34,000 units per month as of H2 2015, and explained that the company will achieve Gen8 60,000 units capacity from Q2 2017. 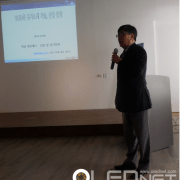 This year’s installation investment is expected to be of 4-5 trillion KRW. Along with this, LGD expects global oversupply of LTPS capacity, and revealed they will transform LTPS into plastic OLED (POLED) in stages. LGD emphasized that the 55 inch FHD line’s golden yield has been almost achieved. The UHD section is also improving yield according to plan.